Are you ready to be a winner?! Play 888 Dragons Slots for your chance to win exciting prizes! There are loads of exciting features that makes this game extra special and extra fun! To find out, just spin the reels and see what you’ve won! 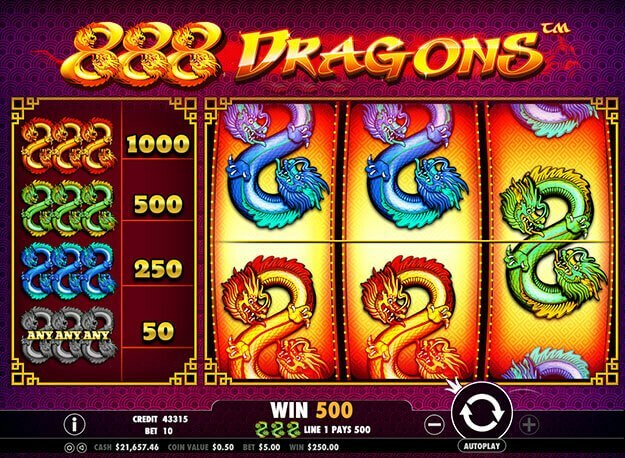 888 Dragons slot is a 3 reel and 1 payline slot game themed on the wonderful creature in Chinese Mythology, Dragons. In this tradition, they are known to have long lean bodies, four legs and a beard. Even though they are known to control natural disasters like floods, tsunamis, cyclones and more, they are also used to symbolise strength, luck and prosperity! Join the three wonderful dragons at Gossip Bingo, and watch them land to form winning combinations! Dragons you will find on your slot grid are gold/red, yellow/green and blue/light blue dragons! The paytable is located on the left end of the slot grid, which shows you how much each symbol pays out. The top paying symbol is the gold/red dragon, which awards 100x your stake for a three-symbol combo. Set your bets by clicking on either the + or – button, which will open the bet and bet levels tabs for you! Adjust your stakes and click on spin to start your gameplay! Autoplay is also at hand, and lets you set 10 to 100 games to play handsfree! Bet Levels: Range from 1 to 10. Amount of Paylines Selection: All paylines are fixed and are not adjustable. Bonus rounds are not available on 888 Dragons.